Congrats to World Series Champions The Yankees! NEW YORK – The New York Yankees bolted from the dugout even before the last grounder was scooped up. After waiting nine years for championship No. 27, no one would dare hold them back. "It feels better than I remember it, man," captain Derek Jeter said. "It's been a long time." Hideki Matsui tied a World Series record with six RBIs, Andy Pettitte won on short rest and New York beat the Philadelphia Phillies 7-3 in Game 6 on Wednesday night, finally seizing that elusive title — the most in all of sports. Paint the town in pinstripes! Nearly a decade after their dynasty ended on a blooper in the desert, the Yankees are baseball's best again. Matsui, the Series MVP, powered a quick rout of old foe Pedro Martinez. And when Mariano Rivera got the final out, it was ecstasy in the Bronx for George Steinbrenner's go-for-broke bunch. What a way for Alex Rodriguez and Co. to christen their $1.5 billion ballpark: One season, one World Series crown — the team's first since winning three straight from 1998-2000. "The Yankees won. The world is right again," team president Randy Levine said. The season certainly ended a lot better than it started — with a steroids scandal involving A-Rod, followed by hip surgery that kept him out until May. "My teammates, coaches and the organization stood by me and now we stand here as world champions," said Rodriguez, who admitted using steroids from 2001-03 while with Texas. "We're going to enjoy it, and we're going to party!" Utley tied Reggie Jackson's record with five home runs in a Series. But Ryan Howard's sixth-inning shot came too late to wipe away an untimely slump that included 13 strikeouts, also a Series mark. Meanwhile, Phillies pitchers rarely managed to slow Matsui and the Yankees' machine. "I told them that I loved the way they played. We're fighters and never quit," Philadelphia manager Charlie Manuel said. "We want to keep what we got as far as attitude and chemistry." For second-year manager Joe Girardi, a three-time Yankees champion as a player, it was the fulfillment of a mission. When he succeeded Joe Torre in October 2007, Girardi chose uniform No. 27, putting his quest on his back for all to see. His tenure didn't start out so well, with New York missing the playoffs in its final season at old Yankee Stadium following 13 consecutive appearances. "To be able to deliver this to the Boss, the stadium that he created and the atmosphere he has created around here is very gratifying for all of us," Girardi said. This championship came eight years to the day that the Yankees lost Game 7 of the 2001 World Series in Arizona on Luis Gonzalez's broken-bat single off Rivera. Fittingly, it was dedicated to the 79-year-old owner, who has been in declining health and didn't make the trip from his home in Tampa, Fla. Still, his presence was felt. "Boss, this is for you," the giant video screen in center field flashed during postgame ceremonies while his son, Hal, the team's managing general partner, accepted the championship trophy. For the Four Amigos, it was ring No. 5. Jorge Posada, Jeter, Pettitte and Rivera came up together through the minors and were cornerstones for those four titles in five years starting in 1996. Now, all on the other side of age 35, they have another success to celebrate. And surely they remember the familiar parade route, up Broadway through the Canyon of Heroes. "It's an honor for me to win a championship with those guys. They are Yankee legends," Mark Teixeira said. But, hey, Babe and Yogi, Mr. October and Joltin' Joe — you've got company. Teixeira, CC Sabathia and a new generation of Yankees have procured their place in pinstriped lore. Moments after second baseman Robinson Cano fielded Shane Victorino's grounder and threw to first for the final out, Joba Chamberlain and Nick Swisher led a victory lap around the warning track, carrying flags that read "2009 World Series champions." Players high-fived fans, then sprayed bubby behind the mound — the same sort of celebration Philadelphia enjoyed last year after beating Tampa Bay. "We think we can be back here again and again. We have a great squad," Phillies closer Brad Lidge said. New York's eight seasons without a championship was the third-longest stretch for the Yankees since their first one, following gaps of 17 (1979-95) and 14 (1963-76). Jackson's three homers in Game 6 against the Los Angeles Dodgers made the Yankees champs in '77. On this November night, Matsui delivered a sublime performance at the plate that made Mr. October proud. "It's awesome," Matsui said through a translator. "Unbelievable. I'm surprised myself." Playing perhaps his final game with the Yankees, Matsui hit a two-run homer off Martinez in the second inning and a two-run single on an 0-2 pitch in the third. A designated hitter with balky knees, Matsui came off the bench in all three games at Philadelphia. Still, he had a huge Series, going 8 for 13 (.615) with three homers and eight RBIs. His go-ahead shot off an effective Martinez in Game 2 helped the Yankees tie it 1-all. Matsui's big hits built a comfortable cushion for a feisty Pettitte, who shouted at plate umpire Joe West while coming off the field in the fourth. Still, Pettitte extended major league records with his 18th postseason win and sixth to end a series. The 37-year-old left-hander, pitching on three days' rest, became the first pitcher to start and win the clincher in all three postseason rounds. He beat Minnesota and the Los Angeles Angels in the AL playoffs. Pettitte lasted 5 2-3 innings, allowing three runs, four hits and five walks. Chamberlain and Damaso Marte combined for 1 2-3 innings of scoreless relief before Rivera secured the final five outs. "You don't look at it as a failure," Howard said. "We had a great season. We just got beat by the better team." It had been nearly a half-century since players had won five titles with one team. The last to do it? Of course a bunch of Yankees: Yogi Berra (10 titles), Mickey Mantle (seven) and Whitey Ford (six) in 1962, according to STATS LLC. NOTES: Jeter batted .407 in the Series. ... It was the fourth time Rivera got the final out of a World Series. ... Yankees LF Johnny Damon left after three innings with a strained right calf. Congrats to the Phillies fans here. They played great and made it a very nerve wracking, nail biting series!! NOW for some eye candy!!! The Yanks win again, BOOOOOOOOOOOOOOOO!!!! LOL! Congrats to the Yanks, my Phils just didn't do enough to beat those guys from the Bronx. The Phillies didn't give it to them that's for sure! 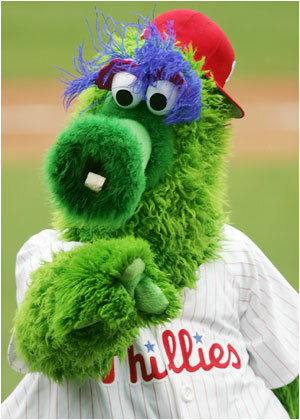 Baseball has such weird mascots..philly sandwiches and socks? =/ How strange..
Am I confused? Isn't it the Philadelphia Phillies and Boston Red Socks and Somebody White Socks?! LOL Colton, yeah it's the "Chicago White Socks"
By the way they played I'd say they did, they wait until the World Series to go cold on offense. Ryan Howard and Jimmy Rollins, are two best bats during most of the season, went cold in the series. If it wasn't for Chase Utley hittin' those HR's the Yanks might of ended things sooner. LOL Colton! OK, I get you now. Yeah there are some teams that go by the "SOX". Thats real old school. They used to be called the RED STOCKINGS..LOL. Its old fashioned though from like the late 1800's!! They shortened it over the years, same for the Chicago White STOCKINGS..lol. And they were called that for the simple fact that they wore red or white sox with their uniform! Please don't ask me what he is...LOL!!! The Yankees have achieved a level of success in the world of baseball that is so gaudy, so well known, and so storied picking a handful of players to call their all time best is no easy task. They should be always competitive enough to keep pace with the others. I used to attend their games even their ticketsget sold out. Luckily I found Ticketwood.com, now I’ll before compare prices before getting tickets. Go Yankees!! Subject: Re: Congrats to World Series Champions The Yankees!